Here's a quick rundown from the world of business and economics this morning: the things you need to know, and some you'll just want to know. • Singles today know: If you're looking to meet that special someone, it's worth checking out Match.com, JDate, OKCupid, or one of the myriad other dating websites out there. But if you're looking to meet that special investment, you might want to visit Hedgez: Basically, it's a dating site that links up investors and hedge funds, based on the compatibility of their profiles. • Given the difficulty that millions of Americans have already faced with using the HealthCare.gov website, some may be worried: What if I don't manage to sign up for health care in time and have to pay the IRS a penalty? Well, as our friends at USA Today reminded us all today, there's not much to be afraid of. Thanks to how Congress wrote the Obamacare legislation, the IRS will have little leverage to force people to pay those fines ... er, taxes. %VIRTUAL-article-sponsoredlinks%• Etsy, a popular online marketplace dedicated to handmade items crafted by artisans, is going corporate -- sort of. It's now allowing sellers to work with outside manufacturers, or open small factories of their own. 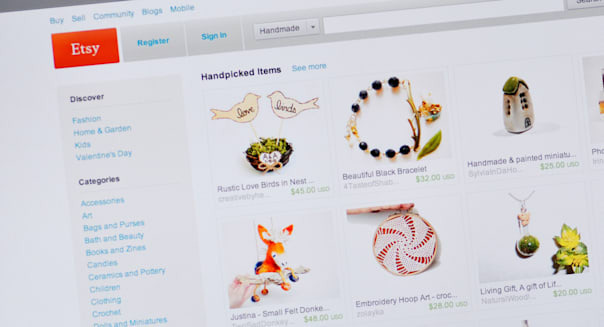 Etsy's CEO says the change is intended to let successful sellers grow their small businesses without booting them from the site, but that isn't stopping detractors from saying it compromises the whole Etsy philosophy. Still, anyone worried that this will lead to Etsy sweatshops should take a deep breath. Any seller who wants to work with an outside manufacturer will have to apply and be vetted by Etsy, to ensure the arrangement meets its ethical guidelines. • Former Obama economic advisor Christy Romer has a fascinating suggestion for how the United States can successfully fight every future recession: Write a law that would put stimulus measures on autopilot. If that sounds a little crazy to you, click through and read on, because it just might be crazy enough to work.